“Prefer nothing whatever to Christ,” from the Rule of St. Benedict has guided Sister Margaret Nelson through her 50 years as a Benedictine Sister of Annunciation Monastery. 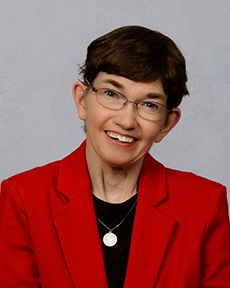 On June 9, she will celebrate her 50th anniversary of monastic profession with family, friends and her monastic community at Annunciation Monastery. From grade school on, Sister Margaret felt called to become a sister. She admits, “But it took a few years for me to say "yes" to that call.” At 10 months old, Sister Margaret was not expected to live. She had encephalitis which left her in a week-long coma. Miraculously, she survived. “The only damage is that my tongue and lips are paralyzed, making it hard for me to talk and swallow,” she explained. Sister Margaret graduated from Priory High, which was operated by the Sisters of Annunciation Monastery, where she says she “observed the sisters at close range.” "I felt this inner tugging to be a sister, but I didn't want to give up what I thought was freedom." Leaving her options open, she attended Minot State University for one year. She became homesick for the sisters, the monastery, and the beauty surrounding the monastery. Sister Margaret became a postulant in 1966 and made her first vows on July 11, 1968. She earned a bachelor’s degree in history from the University of Mary and a master’s degree in journalism from the University of Iowa. She served as monastery secretary to three prioresses, Sisters Susan Lardy, Susan Berger, and Nancy Miller, over a span of 20 years. A gifted writer, she also used her skills to write and edit monastery publications and reflections. She has the gift of capturing the spirit of sisters when they pass away by writing poignant obituaries about their lives of faith and service. She continues to write and edit when called upon. Sister Margaret remembers telling God, "OK, you can have your way, I'll be a sister." She now says, “I have found more freedom for spiritual growth, career options and opportunities to love and care for people than I thought possible. My friendship with God continues to grow and deepen.